While it’s been a busy few last couple days I thought I would get a quick post out of the way as I had an idea for something goofy and quirky so I put on my photography hat and went to work. I needed to throw a little fun back up on the pages after doing something more on the serious side in the previous post. It just happened my inspiration came as I was hanging out at my friend Lucky’s place and he allowed me the opportunity to do a photo at his place. It also gave me the opportunity to feature some cool things that I thought worked well together. This post won’t be a big as they have been since this was a just a short jog in a sense but like I said it was fun and I hope others can find the humor in the soundtrack I chose for the entry as it’s kind of a classic in a way. Modulus just released the new Darren hair over the weekend at The Clique event, which is inspired by the film “The Breakfast Club”. While most people are unsure of what that is, I was a youngster when the film was first released and probably was not watching movies like this at the time. It is one of those films that is a favorite of many not just those who saw it then but those who have come across it in the years since. Darren is modeled a bit after the character, John Bender, who is played by Judd Nelson (who just happened to voice on of my favorite Transformers in the animated movie that debuted a year after this film). Sometimes male hair when aided by accessories (like hats for example) fall short of expectations but this hair which has an incorporated headband (with 6 fabrics available in each of the color HUDs with integrated tinting) figuratively shapes this hair. It’s definitely something that works with a lot of the other Modulus releases for instance if you own them and go from just hanging out to playing some type of sport activity (or being goofy and playing living room basketball like my goofy self) it is a great transition. If sweatpants and sweatshirts are your thing then you’ll definitely want to head to GUTCHI as soon as possible and become a group member (free to join at present moment) and pick up their most recent group gift which is this complete outfit that comes complete with a HUD that allows you to color 6 different parts of it (with a choice between 7 different colors). It’s available for owners of Belleza (Jake) and Signature (Gianni) mesh bodies and is definitely worth giving the store a look along with the other items (including shoes and accessories) that they sell which are excellent quality. As I looked through my varied and copious amount of poses in my arsenal I found that I really didn’t have what I was looking for or something I didn’t already use that would fit the idea I had so it was off to the Marketplace to see if I couldn’t find something that would be just right. 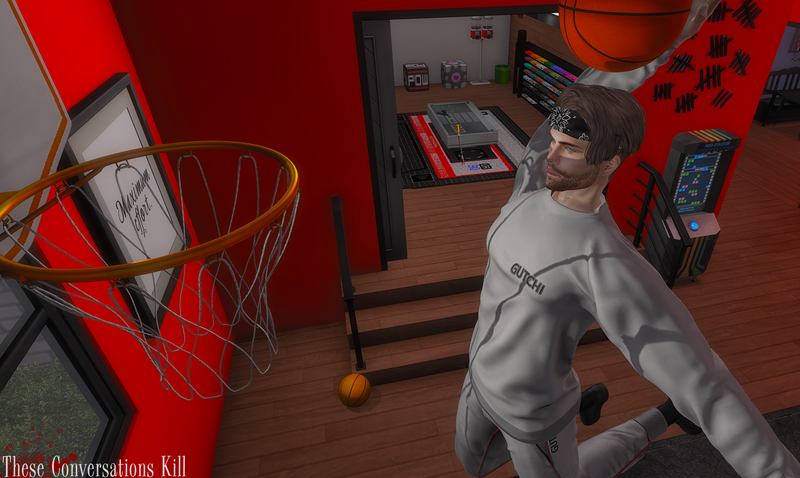 I came across a set by AM Poses which really caught my eye (several different styles of Dunk style basketball poses) and that was all I needed to see. The pack of poses even includes the ball so that you wouldn’t have to look all over try and find a ball if you didn’t have one (or create an extra expense if you are on a budget). While I wrap this up I want to thank Lucky again for allowing me use of his space to pull this idea off because it was a lot of fun trying to be nerdy while appearing to be serious and Air Jordan like. Though it is time for me to get back into prep mode to figure out what will come next as I do have several thoughts but which one is the easier to pull off will be what you see next on the page. Hope everyone had a great weekend and strive to have a wonderful week!